Big drop in past 2 days nearly reversed the rally from Monday to Thursday morning. As you may know from our post yesterday, we bought SPY puts when ES was trading around 2065 — we bought those at $.79. Today, they close well over $3 — and we cashed out our last piece at $3.11 (we cashed out the first half at $1.81 yesterday). Today we also realized our 207.5/209 call spread since we had gains of $1,000 and the max profit on that trade was $1,200 — so we were close to 80-90% of potential profit. Given the action after the close (big drop) – we could’ve held on, but not worth the risk with profits on the table. Last week we talked about how we realized $2500 by betting that the market would stay below 210 in the SPY – indeed it stayed well below 210 and thos optionso expired worthless, which means we collected our full premium of $2500 — the way we collected that weekly premium — was just like the way insurance companies make money. Insurance companies bet that you won’t get into an accident, –and they have information about you. Likewise, we bet that market would stay below 210 at expiration — and we had information about the markets — historical wave pattern information. And based on that information, we we made that bet and collected our weekly premium. and we also said we bought puts and did another short call spread with short strike 206.5. Now how did these two trades from last week do? Well, initially earlier this week on monday and Tuesday, they were up big–the SPY went all the way below 201 — but then the market rallied into the Fed meeting on Wednesday — where they raised interest rates for the first time in some 6+ years. Because of the Fed announcement and the rally into it– we had to exit the put at puny profits — and the short call spread, we lost a tiny bit — so it was basically break even — in order to reduce risk. Reallyl, we should’ve realized gets especially when 90% of our maximum profit potential was hit on Monday. But instead, we didn’t close out — and the market rallied our gains evaporated. But didn’t want continue holding into the Fed meeting — because crazy things happen on Fed day. Sometimes, that’s what you gotta do if there’s some big news event like there was this week on Wednesday. So what happened during the fed announcement? 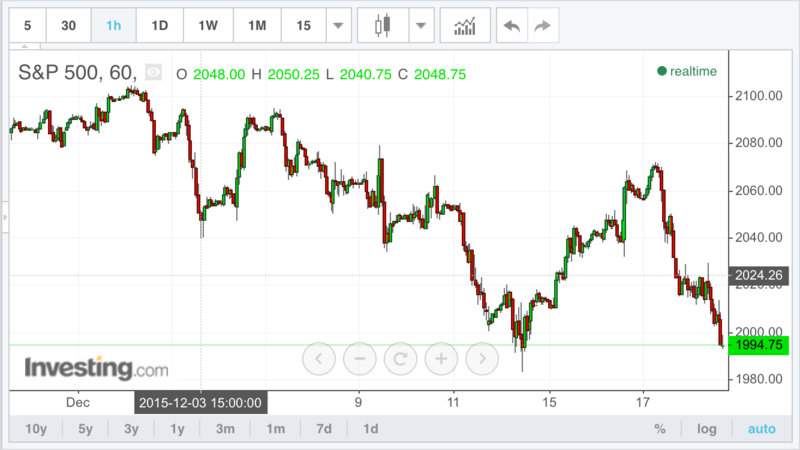 The ES (S&P futures) were around 2045 –they initially dipped down to 2030–then rallied into the close at 2065. Overnight, it hit over 2070. Lots of people were saying that this was a super bullish pattern and that we were going to hit new highs. We really looked carefully at the wave patterns posted on our blog our prediction for what exactly the wave pattern was with this fed announcement. We were convinced, that this rally —would turn over. In fact, we specifically said that if it ever touches 2045 on the day after the Fed announcement, the entire market would turn down. Well, guess what — when the market hit 2070 (SPY 209) and started to turn down to 2065 — we weren’t sure yet whether 2045 would hit, but we were fairly confident with what we saw in the pattern–which suggested the market would turn over soon. So we alerted to our members that we bought SPY puts expiring the following Friday for $.79. Then the market started to fall. From 209 it fell to 208, then 206. At the 206.5 mark — the same short strike of our trade earlier in the week — that was our signal. That’s the equivalent of ES2045-ES2045. Once it touched that area — we knew we were right. So we sent another alert to our members saying that we are shorting the 207.5/209 call spread expiring the following Friday. 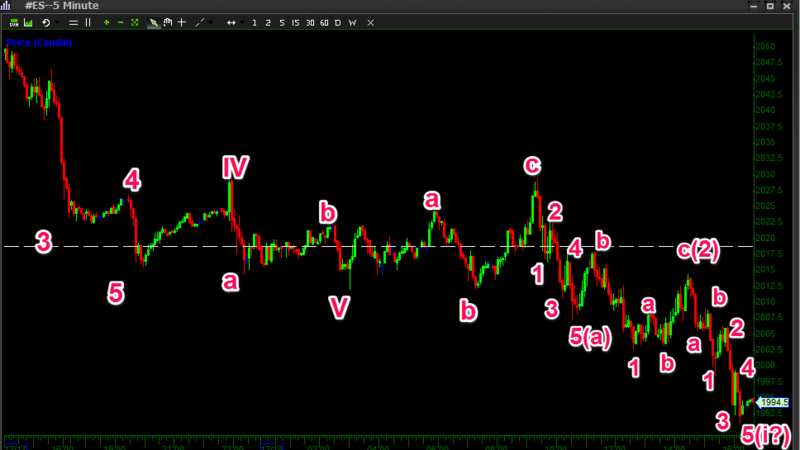 Our max profit from this trade is only around $1200. We kept it small because we also put a $1600 bet on the puts that we bought at $.79. Well, the market just tanked afterwards. From 209 Wednesday morning to below 201 on Friday’s close. $1600 more than doubled to well over $3,000 within the day. That $.79 put went all the way to $1.81 — which is where we sold half — and then it closed on Friday well over $2. Well, guess what, today Friday it went over $3 — and we cashed out —that’s more than triple from the $.79 where we bought it–so we realized some $2500. Also – those call spreads that we said earlier that had a max profit potential of $1200 — well, our gain on that position was at $1,000 — and we still had the entire next week for expiration. So rather than risk losing our gains over the next week and since we already reached some 80-90% of our profit potential, we decided to cash out on that. And we actually closed out that trade in a live video that we posted for our members as well as on youtube. You can get that video simply by searching for life style trading 101 on youtube. So those were our two trades. From last week, we had to close out the puts and call spreads before the meeting — basically at break even. Then after the fed rally, we bought puts and sold the call spread. The puts were up 300% and the call spread reached 90% of our max profit – so we cashed that out. So this week we were profitable again. Those who were able to follow our trades from last week — even if you didn’t do what we did — which is exit before the Fed announement, wait for the market to settle, then re-enter—- you still would’ve been up a good amount. Remember, our bet was that SPY would stay below 206.5 today expiration Friday. And even though it did up and down during the week with the fed and all — it did end well below 206.5 — towards 200 — so our bet turned out to be right. What’s our outlook for next week — well, pretty bad for the S&P. We ourselves are short futures. In fact, we’re still holding onto our short of the Russell TF from 1197.5. And that has dropped more than 80 points below 1120. We’re still holding on. Well, that’s the recap for this week. We may have cashed out of puts a bit early, but if you still have puts, you should be pretty happy next week. Signing off, this is Silver Surfer, and if you’d like to learn more about our strategy, options, or elliott wave theory, check us out at www.lifestyletrading101.com – subscribe to our blog updates and we’ll be teaching you everything you need to know to make money right from your mobile phone. All it takes is one trade a week. Best of luck trading and I’ll see you guys next week. Previous post Thursday 12/17/15: SPY -1.52% Post Fed rollover (good prediction!) Puts up over 100% Next post Monday 12/21/15 – Corrective 2 to ES2020?